Trail running can cover a broad spectrum of surfaces depending on where you live. 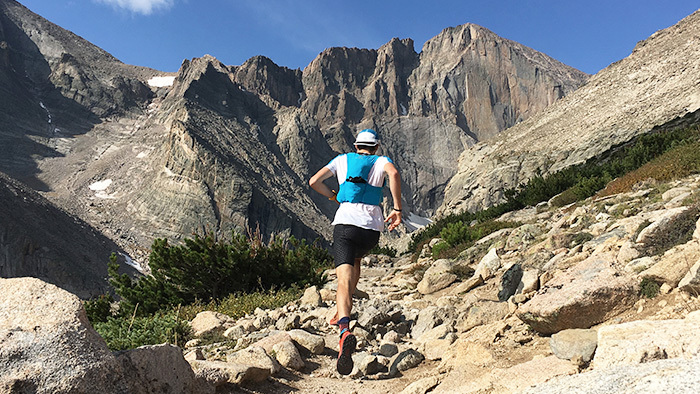 One athlete’s version of trails may be vastly different than another’s. Therefore it is important to define the surface/terrain and characteristics of the trail you are training on, as well as the surface/terrain of where you will be racing. When you hear the term “technical” used to define your race, be prepared for some rough terrain. This is the ultimate off-road test for the endurance runner. Technical trail running is defined by the surface and environment you are running. Does it have rocks, roots, mud, water, steep climbs and steep descents? Are hiking poles recommended? Are there sections where you need to use your upper-body to assist? 1. Schedule your training based on time and effort not distance and pace. Technical trails slow you down, without the usual lessening of effort. Straining to keep a certain pace is a surefire way to make the experience fairly miserable, and if your race is an ultra, this could be a race killer. Using time as your framework you can focus solely on the terrain under your feet and moving efficiently. 2. Incorporate balance (single-leg exercises) and plyometrics (split and squat jumps) into your training plan. Learning to jump and land is an essential skill when foot placement becomes a selective process due to rocks, roots, and loose surfaces. Single-leg balance and coordination exercises improve proprioception, which is a key component to moving quickly through technical terrain. 3. Foot strike cadence is key to staying upright in technical trail racing. Fast feet move over the terrain quicker, and spend less time in contact with the ground. When the footing is poor, this is crucial. The feeling of producing fast feet could be best described as “touch and go.” Move through the terrain, avoid stop and go movements, which slow you down, waste energy and can even make the terrain harder to pass through. Take the most efficient path. If your training grounds don’t offer up similar terrain to what you will be racing on, use an agility ladder, practice taking shorter strides during your daily runs, and learn to study the ground while running. On trail, your feet go where your eyes focus. 4. Keep your toes up. In order to avoid catching your feet on roots, rocks, and even minor bumps in the trail, run with a toes up approach. This often entails minor heel striking. But with proper footwear, a shorter stride, and good knee lift this shouldn’t be an issue for anyone. Having the proper footwear ensures protected feet, and upright running. Find a shoe that provides a secure heel fit. Once laced/tightened you should not be able to slide your foot out of the shoe. When you place your foot the last thing you want is your shoe rolling from side to side or your foot moving in the shoe. The shoe tread matters, so make sure your shoes have a tread pattern that can handle the technical trail. Lugs help you climb hills, rocks and muddy slope. They also help you brake when needed on steep descents. A good tread pattern will clear mud as you run and not hold onto water after a stream or river crossing. Shoes also provide much-needed protection. If you can feel every pebble you encounter it will make for a long day on trail. A small rock plate built into the shoe can be a superb counter for this. Plan ahead for what you need from your footwear as the miles accumulate and your legs get tired. 5. Harness the beginner’s mindset in training and racing. Trail running is zen running. The most natural form of efficient bipedal movement. Racing on technical trail is the peak of difficulty. Therefore, you must strategize in order to get results. Make your main goal to be a race finisher. Compete only with the trail. This will free you from the chaos, stress, and strain of overall and age group placements. Racing on this terrain is a skill you will develop over time and trail miles. Be patient. Don’t be ashamed to hike the hills. If the race will take longer than 90 minutes and you know that climbing is not your strong suit, hike up the hills. Patience goes a long way in these races. In ultras this is even more important. Also, consider using poles. Have you thought of using carbon trekking poles? Practice with them in training. They can help keep you upright and pick your path when downhill running, stream crossing, and even on steep climbs where the footing is loose or uneven. Technical trail races are extremely rewarding. Often held in beautiful and remote places, the environment is very motivating and engaging. You may even forget you’re racing and take the mindset of explorer as you cover mile after mile of remote scenery. To ensure you make it to the finish line make sure to plan ahead and cover your bases in training. You can never be too prepared when the going gets tough and technical!